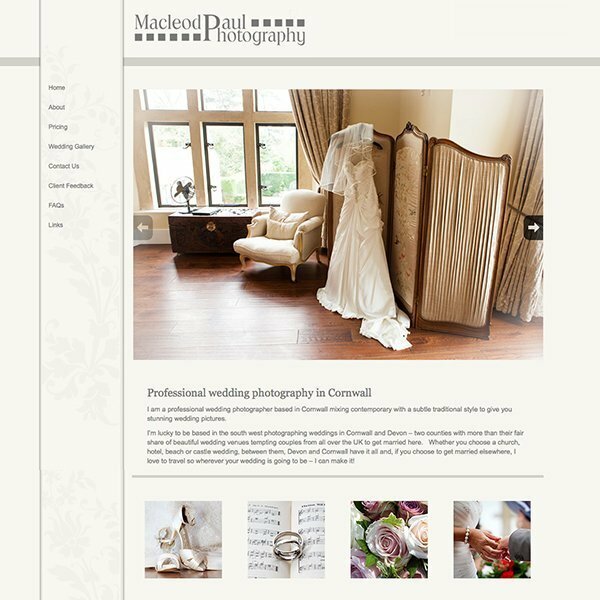 MacLeod Paul Photography are photographers working in St Ives, Camborne and Redruth in Cornwall. They specialise in wedding photography and have done shoots in some beautiful settings including the Carbis Bay Hotel. They felt that their site was too similar to others in the business and also that it was not as professional as they would have liked. They had previously created their own website and so needed to be able to continue to edit the content themselves. This was not a responsive web design, it was done way before this became a requirement. Unfortunately when Colin wanted to update his website I did not have any availability and I could not meet his budget requirements, so it was done by another web designer. I have created quite a few photography showcases since I have been a web designer and have seen some fabulous photographs. One of my favourites is for a personal photography portfolio website for Jan-Eric Osterlund and you can see more details on the portfolio page. More recently I have created a very simple black and white design where the photos absolutely speak for themselves for Paul Denby. Paul takes what most people would see as mundane and turns it into beautiful photography. Then there is the portfolio website for Annelie Eddy, who is a London wedding photographer, you can see more on that here.